Boomboom did really well on his half! He came in around 1:49, which is great! Kandy was the 5th woman finisher and beat her time from last year by 2 mins! Another friend, DD, PR’d and beat her best half-marathon time by a large chunk of time (maybe 11 mins?). I saw a bunch of folks from Seals, a physical training group I used to belong to, so it was quite nice to get to catch up with them. The weather was beautiful – I think fall is finally here! Good job, Boomboom! Way to finish stong! 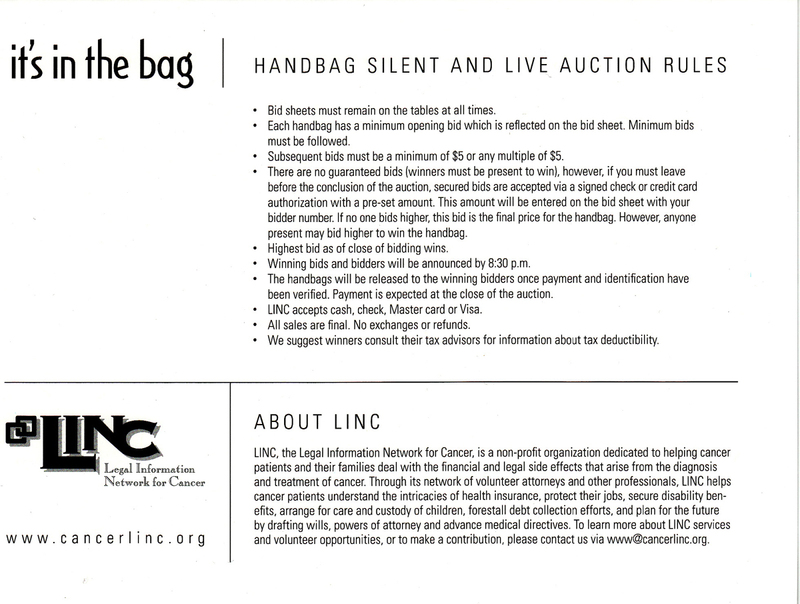 One of my lawyer friends asked me (in a sort of round about way) to design a purse for a handbag silent and live auction that LINC (the Legal Information Network for Cancer) holds every year. Of course I was thrilled to do so – but now I am super nervous! A couple of weekends ago, Boomboom was out of town rafting the Upper and Lower Gauly (fun!) with a bunch of guys. So I took advantage of having a whole weekend of undisturbed creative time and literally became a hermit and worked on my purse. It was a lot of quality time with my sewing machine. 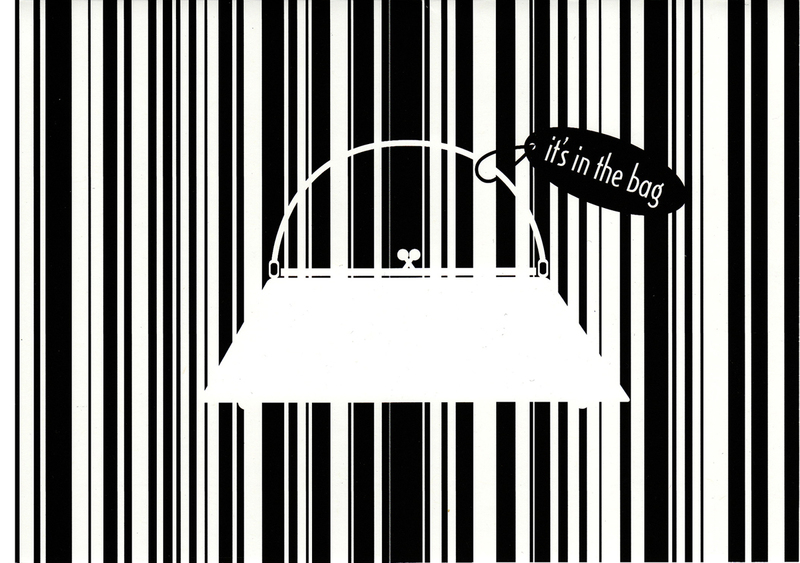 But in the end, I had a completed purse – a large, different-from-all-the-other -submissions-but-I-stand-by-it purse. I couldn’t think of a name for my purse, so I enlisted Boomboom’s help. He kept coming up with “names” that were objects (for example, ‘Grey Pearl’ or ‘Candy Apple’) or names that I thought would not help in the bidding on my purse (like ‘Sasapurse’ and ‘Devil’s Bag’). We finally came to a consensus with ‘Felicity‘. 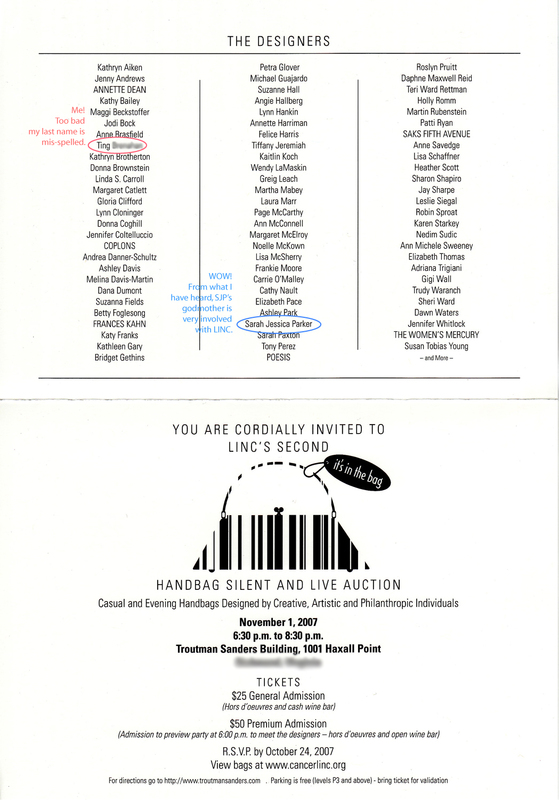 I also wanted to show the invites for the auction – such a good example of how 1 color printing (black ink) can be quite cute and stylish! Boomboom is running a half marathon RIGHT NOW! This morning, I was really tired and didn’t feel like getting up at 615am. And I felt CRANKY and CRABBERS (ie crabby). But then I remembered all the races he got up at the crack for me to run in and cheer me on – all the races he had driven across state lines the night before (after a long day of work) so that I didn’t have to go by myself (ok, just that one, but still) and I really tried to not be crabbers. Since the start of the race was so close to our house, I was able to go with Boomboom, see him step off (and see other friends along the way) and now I am at home, just finished walking Ruby. I will head to the finish line in a few mins. I hope the course is not too hilly (the last half he ran a year or so ago, I kinda strong armed him into running it and it was VERY hilly and VERY hard! this one will not be nearly as hard, but may be a little hilly) or too bunched up at the beginning, or on the trails. My fast ultra-marathon friend Kandy says this course is short – so that is good! Last year, she automatically got a slot in the NY marathon based on this half marathon time. I didn’t even know you could get a guaranteed slot to NY! One day a few years ago, Boomboom and I went to the salon – Boomboom was getting a haircut and I needed to be there as a style consultant. The stylist (so, when Boomboom tells this story, the salon is a barber shop and the stylist is barber) had a crate with a dog in it. He told us that his sister found a beat up dog on the side of a major road – all scraped up and starving. I look into the crate, and indeed, there was a sad looking dog – cuts and scrapes everywhere, super thin fur, and very thin in the body. He brought the dog to the salon so that more people could see the dog, in hopes that someone would adopt it. Anyway, Boomboom gets his hair cut (with much input from his style consultant) and we leave. But the poor, unnamed dog was still haunting me. The next day, I decide to go back to the salon to take unnamed dog on a walk. I feel bad for her on so many fronts: 1) no name, 2) all cut up, 3) lonely and scare, and 4) all pent up in a crate, so I feel like I should do my part to make her life a little happier. We take a (very slow) walk (she’s limping the whole time), and I feel like crying many times along the way. We had been discussing getting a dog for about 2 years, and here was this pitiful dog that needed us. REALLY needed us. So later that day, when Boomboom called to see how I was doing and what I was up to, I told him “I took Ruby on a walk”. He is clearly confused – ” Who’s Ruby?”. I explain to him that I took unnamed dog from salon on a walk and named her Ruby – that she needed a fabulous name. After that, it is all basically history, as they say. A few days later, Ruby moved in with us, and I went from the girl who didn’t like dogs anywhere near her (much less would ever pet a dog) to the champion of all dogs, especially bully breeds. She has enriched our lives in ways I never knew or thought possible. Boomboom read somewhere that having a pet can increase your lifespan by 7 or 9 years and I totally believe it. Ruby is just a fabulous as her name. When she goes into Russian super-spy mode (think Syndney from “Alias”), she definately prefers to be called “Ruble”. We also call her Row-bee, Rub-a-dub, Rub-ee, Row-bers, etc. She responds to them all. And as for her non-purebreed status, Boomboom, who grew up with purebreed golden retrievers and yellow labs (yes, very original and different), tells me she is the smartest dog he has ever had / come into contact with. I dunno if that is just the proud papa talking, but I like to believe him. Isn’t she the cutest EVER?! I got my hair cut today! I really needed it. My hair was feeling all crispy – so I got all the bad ends cut off. It is quite a bit shorter, but BoomBoom (the husband) doesn’t really think so. Thus why BoomBoom has taken to giving me nicknames like “Stinky”, “Pig Pen” and, when my hair is all discheveled, “Nell”. I embrace the names, as he isn’t exactly wrong (or right), but showering is just overrated for me. -> so my hair is long here, as you can see my pony. I love my charm bracelet. Sometimes when I am feeling just a little blue, putting it on and looking at it makes me that much happier. To think of where I’ve been and people who love me. ‘Tis nice. I started my bracelet and “collecting” charms in my early 20s. Lots of people do this when they are little, but not me. Good thing they are classic and have recently had a resurgence in popularity! I’ve started a fancy pants gold one – those charms are way more expensive!